One of the first things that I saw this morning was a tweet from Andrew Hazlett pointing to a Washington Post article by Philip Kennicott about the new Google Art Project. Art Project takes a “street view” approach to 17 art museums, allowing you to walk through some of their galleries and see the works as they are hung on the galleries’ walls. For those who are interested in how art is presented to and consumed by the public, this proves to be an invaluable resource (and shows how far we’ve come since the 2001, when Shelley Staples’s digital version of the 1913 Armory Show came online). But Benjamin writes, “Even the most perfect reproduction of a work of art is lacking in one element: its presence in time and space, its unique existence at the place where it happens to be.” So while we no longer need to go to art, the reproduction’s lack of place reinscribes the aura of the original. The result? By making many reproductions it substitutes a plurality of copies for a unique existence. And in permitting the reproduction to meet the beholder or listener in his own particular situation, it reactivates the object reproduced. These two processes lead to a tremendous shattering of tradition which is the obverse of the contemporary crisis and renewal of mankind. 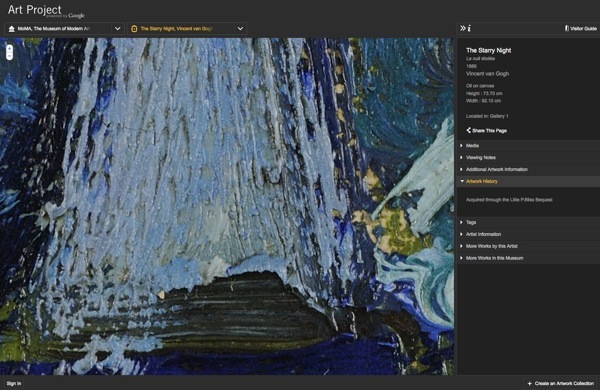 So while it’s true that I no longer need to go to the MoMA to see Van Gogh’s The Starry Night, seeing it in Google Art Project may very well strengthen my desire to see the original, which is what Raby and the other museum directors must be counting on. And of course, all that Art Project appears to show at the moment are works that are no longer in copyright. So if you want to see a Warhol or a LeWitt, you’ve still got to go to the MoMA itself. Mechanical reproductions, then, surpass the original by showing you more than your own eye could see, even if you were with the original. And it was precisely this issue of how much one can see in Art Project that our art history librarian, Kim Collins, asked me this morning when I showed her Art Project. After all, we pay a hefty subscription to ARTstor every year to get high quality images. 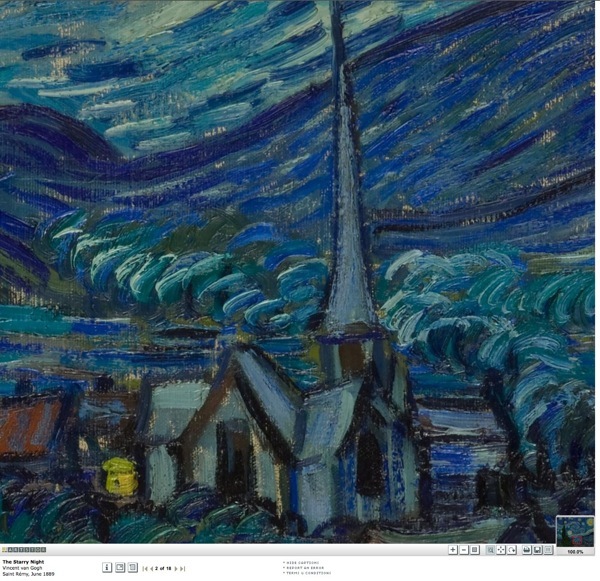 So in the interest of seeing how much I could see, I pulled up The Starry Night (a work that I’ve never seen in person) in both ARTstor and Art Project. Using each platform, I zoomed in as far as I could on the church in the lower middle of the painting. And here is what I saw. Of course, the museums are the ones that provide the images to both ARTstor and Art Project, so there’s every chance in the world that the former’s images will be updated sometime in the future. As I finish writing this, Art Project is a trending topic on Twitter. Although Google tends to have this effect on things, it’s apparent that people are interested in this project–or at least in talking about it. Towards the end of his essay, Benjamin writes, “The mass is a matrix from which all traditional behavior toward works of art issues today in a new form. Quantity has been transmuted into quality. The greatly increased mass of participants has produced a change in the mode of participation.” By throwing a tremendous quantity of pixels at Art Project, Google has produced something of quality that will shift how the masses see art. And perhaps a key lesson to take from Art Project (if we can extract a lesson on launch day), is that it’s a clear demonstration of the opportunities that the digital humanities have to reach a larger audience, provided we can show them something new or something more in a (visual) language they understand.